With a Russian/Dutch heart: A wonderful visit to Heidi yesterday. A wonderful visit to Heidi yesterday. Wednesday I managed to get a few things done around the house, so I felt not so guilty LOL. Yesterday afternoon I went to Heidi. It was about time we had a proper chat in peace, and gosh, we talked about all through, as girls can do and it was wonderful. I came back with a little bag, in it where some prepare small pots with soil and seeds of several vegetables. There is an action in a supermarket, where they give you a little pot with dried soil and a tiny package of seed, on every € 15,00 you spend there. It is meant for children to learn a bit about sowing and such. Heidi had several doubles, so she them to me for Jan. We'll seenow hw many will actually give some veggies hahahaha. Jan called his specialist at the hospital yesterday and he has an appointment for Monday morning. I am glad he finally called and goes there. This afternoon is kind of a big day for him, he will start with his volunteer job. He has to leave from here at about 15.30 and will be home again around 19.45 I think. I will be all curious to hear his experiences today. When he will be gone this afternoon I think I will give myself a good kick in my bottom and will try to find all papers I need for the forms. And it also will help to pass time a bit faster. I think it will feel a bit strange not having Jan around at dinner time, you know! Yesterday I tried to upload again a kit at mediafire, and the uploading was okay, but already for two days i wasn;t able to copy the downloadlink. Normally that goes well and easy, but no, somehow it didn;t copy and I couldn;t paste it on a texte file. So I tried again this morning and it seems to work again. What was wrong, I have no idea, and I don+t care, as long as I can have the link. Think Jan and I will be stuck at the tv this weekend, because there is on the World Championship Allround for speedskating. And you know by now we love watching it. As it is in Calgary, the broadcast will be live from 8.00 p.m. till may be 11.00 p.m. our time zone. So I guess Jan has to make a whole schedule from the programs he will have to put on dvd and video. Saturday is a rather `busy` day with lots of detectives and interesting programs. Oh, Wednesday evening we had the past part of the fantastic serie Missing. It was great, such a pity is has ended for now. I know there is a second season of it, but I have no idea when or if it will be on tv here. But in place a new serie started, didn+t watch it yet, we have it on dvd, I think this one is exciting too. Forgot for now the title, I will let you know next week, okay? Time to finish and soon make some fresh coffee and then wake up Jan, and such. 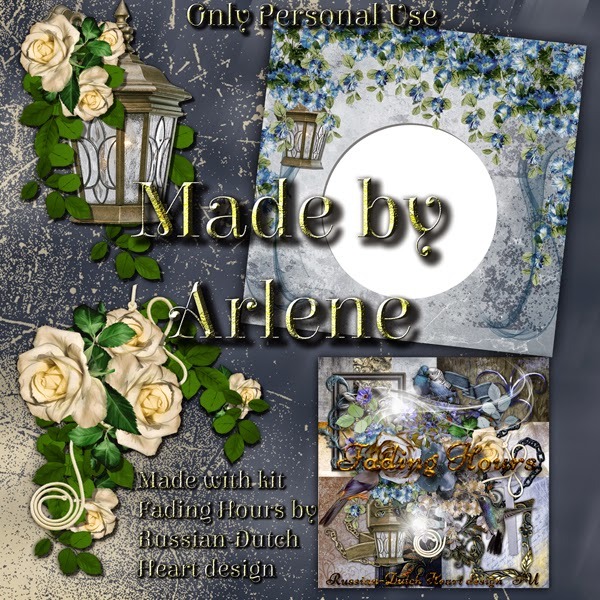 Today I have the clusters from Arlene made with the Fading Hours kit. Wishing you a wonderful weekend, take care! Hello and Thank you Kyra for these lovely clusters - wonderful work yet again from Arlene. Hopefully Jan will enjoy his volunteer work and his visit to the specialist will go well too. Thanks for the white rose cluster!!! It will be perfect for the scrapbook that I'm doing for my nephew. Good luck to Jan at his new job. I hope his doctor visit goes well. I love the idea of giving away little pots of soil and seeds. I will interested to see which of your seeds product some veggies. It will be quite a long time before we get to see our garden again. There is just so much snow on that side of the house that one cannot walk out there. Joe and the girls have all left this morning to head back to their homes. It will be quiet here until late tomorrow when DIL Janet gets here. It was a bit cool this morning, but the sun is coming out and it will be really nice shortly. Well, now I'm going to sit out on my porch and crochet while. You have a wonderful weekend. Hugs, Edna B.
thanks to you both for the beautiful clusters. I hope everything is fine with Jan, when he sees the specialist and I hope his volunteer work went well! Thank you so much for ALL you share!